The Schadt String Competition is the annual national solo string competition of the Allentown Symphony Orchestra. 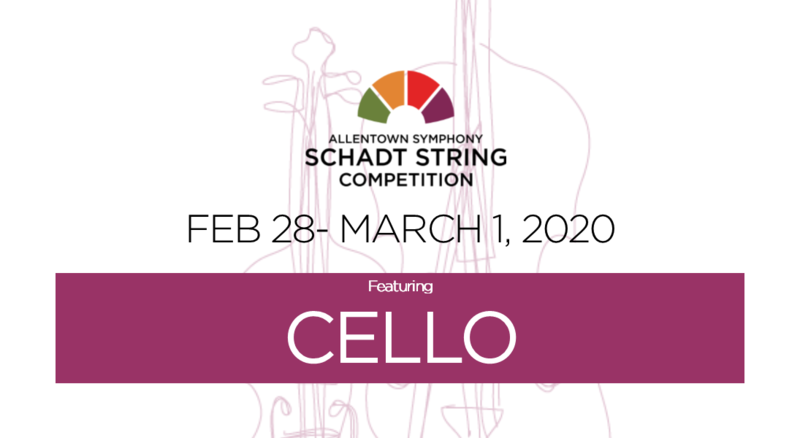 Begun in 1997 following a bequest to the Allentown Symphony Association from Edwin H. and Leigh W. Schadt, the competition alternates bi-annually between violin and cello. The First Prize includes a cash award of $12,000 and a solo concerto engagement with the Allentown Symphony Orchestra during the season following each competition. Edwin H. Schadt (1910-1994) and Leigh W. Schadt (1904-1996) were two brothers who lived in Allentown all their lives. They were the sons of Mary and Henry Schadt, two Allentonians who ran a wholesale grocery business on Front Street in Allentown. Both Leigh and Edwin were born at home in the early 1900s. They lived at 1048 North 11th Street until moving to Luther Crest Retirement Community in the early 1990s. The two boys attended Lincoln School on Walnut Street, went on to prep school at Muhlenberg, and both graduated from the University of Pennsylvania Wharton School of Business in the 1920s. The Schadt brothers became successful Allentown businessmen and established Towne Auto Company on Linden Street. In their youth, Leigh and Edwin were exposed to the violin. Their father was a self-taught violinist and wanted his sons to learn to play the instrument that he loved. Henry commissioned a local craftsman and musician, John Johnson, to make a violin for each of the boys and give them violin lessons. The custom-made violins still exist, and are being used today by young violinists from the Lehigh Valley. Although Leigh and Edwin did not become violinists themselves, they kept their father's interest alive by establishing a trust to provide financial aid to promising young violin students. The trust provides scholarships to area string musicians, sends young musicians to music camps, and underwrites youth concerts. After the Schadts' deaths, the trust provided funding for the Allentown Symphony Association to host the Schadt String Competition.